The inauguration of Barack Obama as the 44th president of the United States was easily recognized by the nation’s citizens as a turning point in our history. More striking, perhaps, was the change it signaled in the way the United States is perceived by the rest of the world. Even before his landslide electoral victory last November, the very fact that an African-American was nominated by his party as their presidential candidate had overturned assumptions about American society that appeared to be widely shared. Those assumptions, as events have shown, were unfair and superficial. Still, they had a foundation in history, namely the long journey toward racial equality that plunged the nation into civil war and persisted in the decades that followed as former slaves struggled for authentic equality as new citizens with full participation in the nation’s economic and educational institutions. The journey was a painful one, through the civil rights marches of the 1960s and the soaring rhetoric and martyrdom of Martin Luther King Jr.
Because of his own multiracial background, President Obama himself can be seen as a transitional figure in the journey toward a post-racial society, but one whose gifts of intellect and language have enabled him to articulate for our nation and the world the meaning of this moment in our national history. For those of us of a certain age and background, Mr. Obama’s assertion that the United States was “ready to lead once more” recalled what the Jesuit theologian John Courtney Murray half a century ago called “the American proposition,” the desire to form one society out of diverse communities, e pluribus unum. Father Murray liked to say that the foundation of our nation will always be a promise still to be fulfilled. The pursuit of a just society, where individuals can live out in full measure their personal dignity, will always be unfinished business, a continuing challenge. The nation’s ability to influence other nations will always depend on our faithful pursuit of that founding American promise. How will Mr. Obama’s claim to a renewed role of leadership for the United States be received by other nations around the world? Our traditional allies will surely welcome it and keep whatever nervous misgivings they may have to themselves. Some nations that have been cast as adversaries in the past may welcome what they see as a change in Washington’s tactics, from military intimidation to international diplomacy. But Mr. Obama’s confident promise of an eventual defeat of international terrorism made it clear that the new president had a realistic understanding of the uses of military power, not only to defend the nation but also to persuade other nations of the advantages of diplomacy over military confrontation. The prayers not only of the citizens of the United States but also of the citizens of the world support our new president, as he has promises to keep. In a sense we've came to our nation's capital to cash a check. When the architects of our republic wrote the magnificent words of the Constitution and the Declaration of Independence, they were signing a promissory note to which every American was to fall heir. This note was a promise that all men - yes, black men as well as white men, - would be guaranteed the unalienable rights of life, liberty, and the pursuit of happiness. I have a dream that one day this nation will rise up and live out the true meaning of its creed: "We hold these truths to be self-evident, that all men are created equal." Would it not be wonderful if President Obama understood the meaning of these words? This article also appeared in print, under the headline "Of Many Things," in the February 2, 2009 issue. 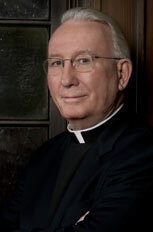 Joseph A. O'Hare, S.J., is an associate editor of America.